Day 4: From here, ride along perfect white beaches of the Walker Bay whale sanctuary, which is arguably the best land based area in the world to watch whales (whale watching capital of the world from June to December – whales and their calves often come within metres of the coastline). Admire these magnificent creatures and their ‘aquabatic’ displays, splashing, crashing and blowing, breaching, lobtailing, spyhopping and sailing close to shore. Enjoy the sandy beaches and experience the thrill of beach riding. leaving the beach, we make our way of the coastal mountain range, descending from Gods Window into the flower valley, a breathtaking array of mountain fynbos. From here, the ride angles down the mountain slopes to Lomond Wine Estate and and fast canters take us back to farm215. 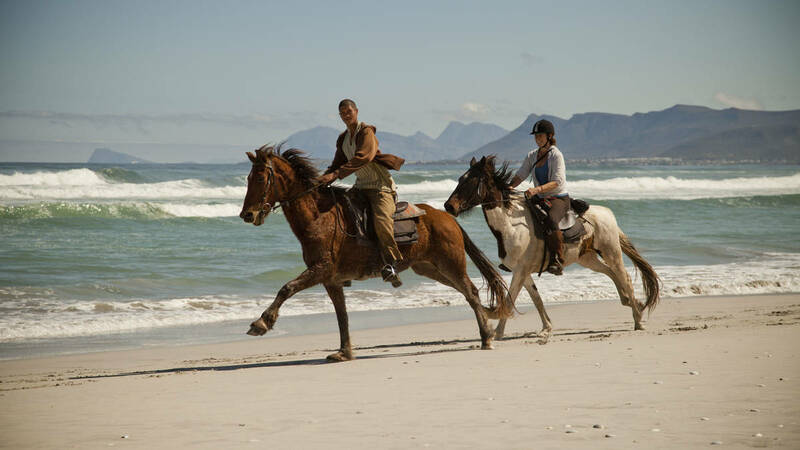 Ride along perfect white beaches of the Walker Bay conservancy and whale sanctuary which is arguably the best land based area in the world to watch whales (whale watching capital of the world from June to December – whales and their calves often come within metres of the coastline). Admire these magnificent creatures and their ‘aquabatic’ displays, splashing, crashing and blowing, breaching, lobtailing, spyhopping and sailing close to shore. Enjoy the sandy beaches and experience the thrill of beach riding. Just before De Kelders the coastline gets rougher with rocky beaches and limestone cliffs which flatten out onto sandy stretches of die Plaat. Before we reach De Kelders (Gansbaai – a fishing village) we will head east through the coastal shrubland and traverse the vast magical almost surreal sand drifts (Grys Dune) of die Plaat. The mysterious landscape will give way to mountain fynbos when we hit the slopes of the coastal hills towards Grootbos and the Flower Valley. We will pass through Grootbos Nature Reserve, which has an award winning lodge and is famous as a botanical hot-spot, and cross Flower Valley, a large valley filled with fynbos and indigenous forests and a Unesco supported project for sustainable fynbos harvesting and education. Day 4: From here, the ride angles down the mountain slopes to Lomond Wine Estate and Back to Farm215.